Your latest Arc Archives is here! The Arc is moving into 2017 with anticipation of continued excellent service and programming for individuals and families. Please take a moment to catch up with what's happening at The Arc! As always, we thank you for your continued support by way of donations, annual membership and volunteerism. We couldn't do this without your involvement! In October, the annual meeting and awards ceremony was held at Belle Meade in Southern Pines. Two new members of the board were voted in along with the naming of new officers. Barbara Childress and Vince Powierski are two new directors. Michelle Milligan and Dave Hale will serve as co-presidents. Gerri Crutchfield will serve as Vice President and Jay Pittard will serve as Secretary/Treasurer. Vergil Shamberger is the immediate past president. 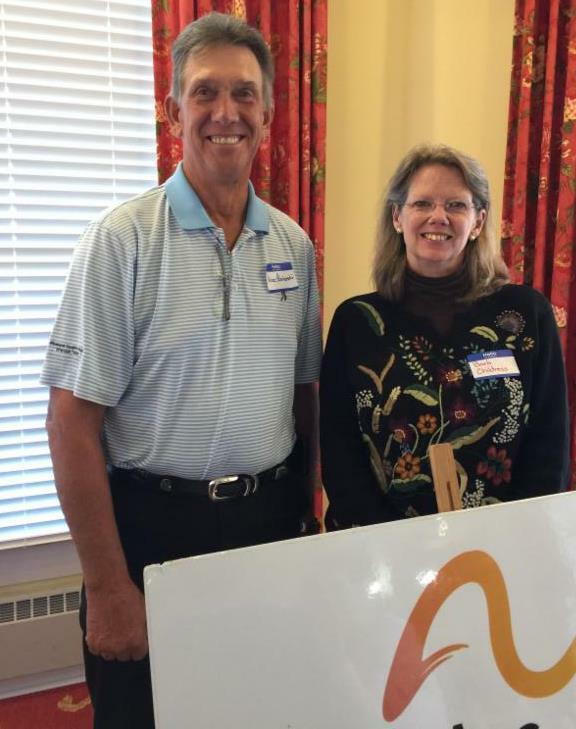 Awards were presented to Laura and Dan Thomason, owners of Gracefully Rustic, for their assistance with the Aktion Club service project this year. Members of the club along with Laura created a design for a chair that would be decorated and placed in an auction to benefit the Moore County Literacy Council. A second award was presented to Scott Holmes, golf professional, in thanks for his efforts in the Inaugural Golf Marathon - Fore For Frank. Other awards included Caroline Hendricks of St. Joseph of the Pines for ongoing support and partnership in events and programming, and to Gerri Crutchfield and Dave Hale for their outstanding service to the board and organization. Vince Powierski and Barb Childress, new members of the Board of Directors for 2017-19. 5th Annual Movie and Snow Spectacular a Success! Once again, The Sunrise Theater was transformed on December 17 into a winter wonderland as The Arc presented the Movie and Snow Spectacular! Over 300 children and adults were treated to carol singing and a visit with Santa before enjoying a showing of the movie "Elf." 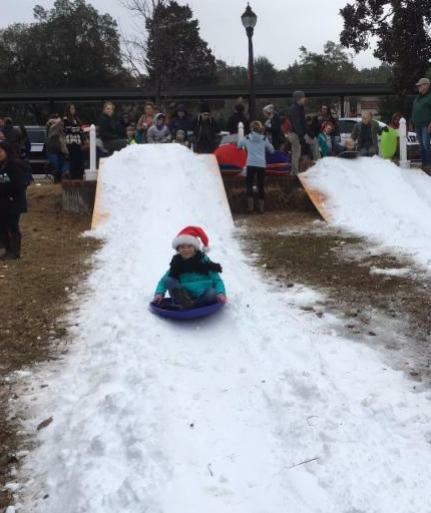 After the movie, the children were released to go outside where snow for sledding and playing awaited them along with a bouncy house and cookies and hot chocolate. There were food trucks available for families to enjoy a meal while the children played. A HUGE thank you to the students of Crew 223 for their help with the sledding and other activities in the snow filled afternoon. The group organized the sledding and bouncy house activities ... We couldn't have done it without them! 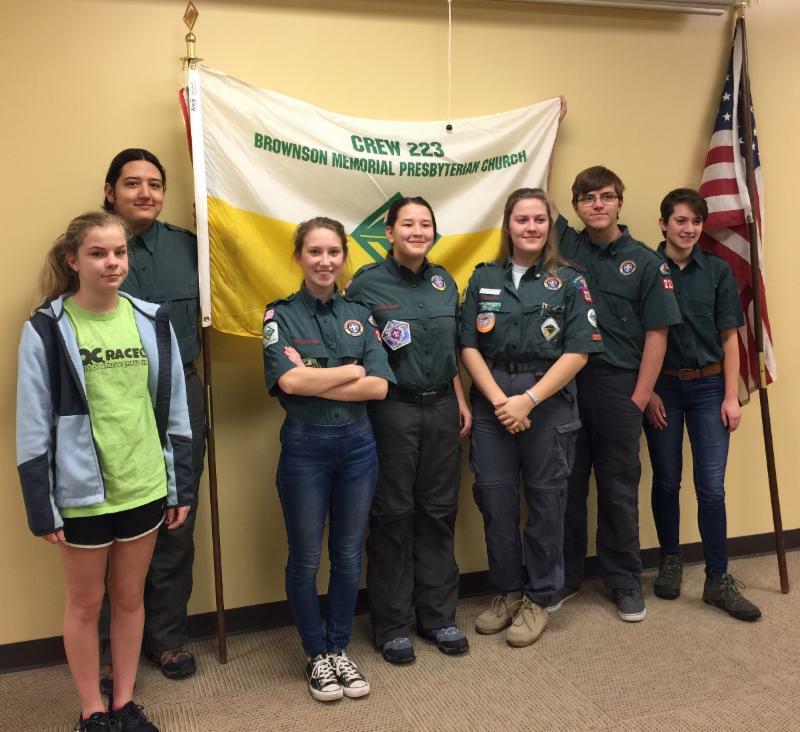 Venture Crew 223 is a co-ed youth development program of the Boy Scouts of America for young people ages 14 - 20. The program is designed to expose the youth to high adventure activities while gaining leadership skills, personal growth and offering service to the community. This group is sponsored by Brownson Presbyterian Church and is led by the youth members, with adult advisors to assist them. The Crew develops their annual program plan, maintains their budget, and leads their meetings. They earn money through fundraisers. Assisting with the event this year were: Ivy and Ian Laton, Savannah Bickford, Alora and Lianna Edwards, Lauren Butler and Shelby Hull. Advisors assisting were Debbie D’Auria and Robin Bickford. The Book Club with director Edna McNeill has started a new year with many exciting plans for their monthly meetings. 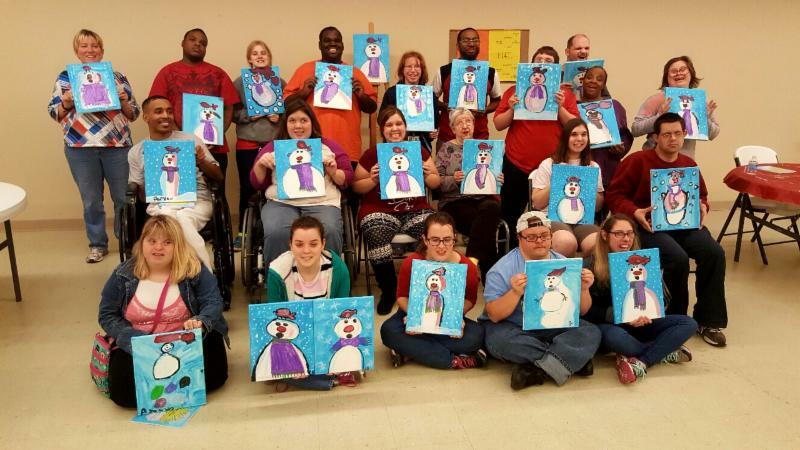 Recently they read Nancy Drew and the Clue Crew - The Case of the Spooky Snowman and then created their own snowman picture with artist Terry Hardison at Monarch Creative Arts and Community Center. The snowman paintings are currently on exhibit at The Arc office. Please come by and take a look! 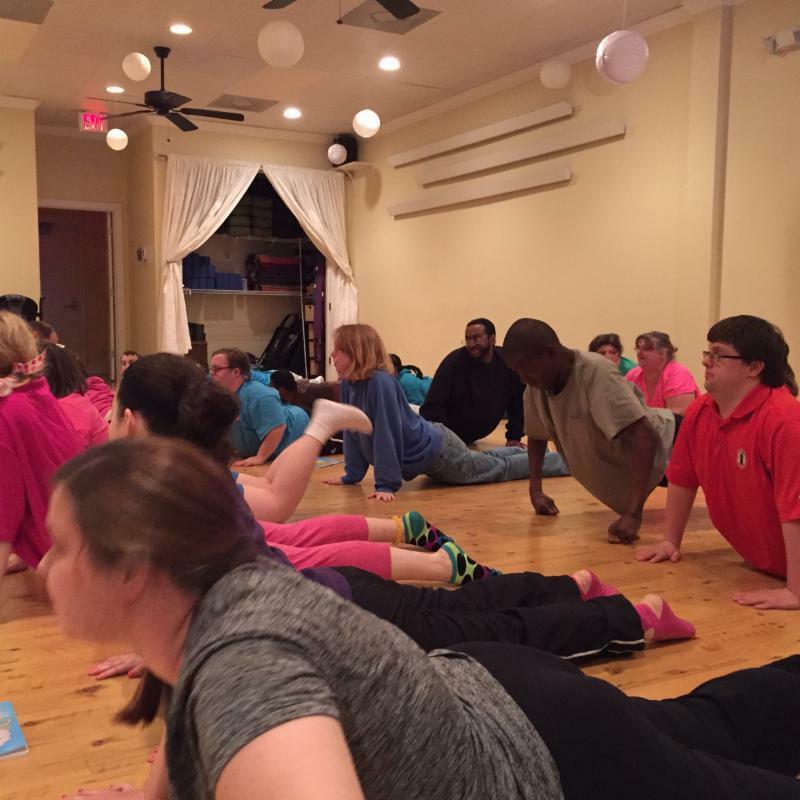 Earlier this month, the group read Who Has Seen The Sun and experienced yoga at Southern Pines Yoga Co. with Michelle Kaiser. For more information or how to join, please contact the Arc of Moore County at 692-8272. 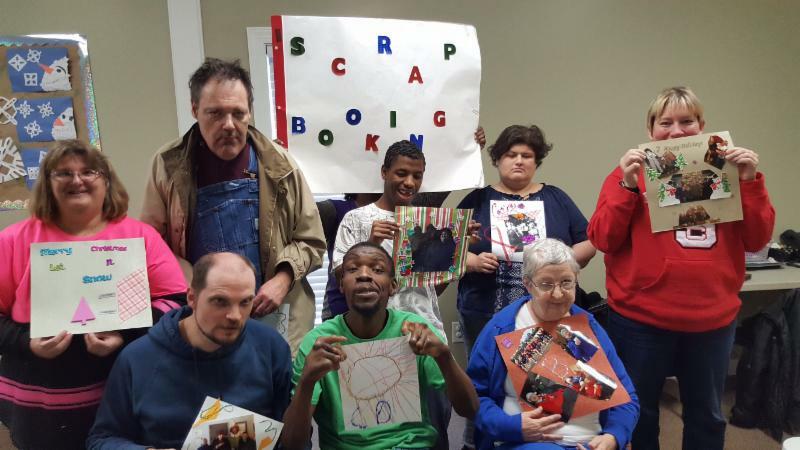 Last year, the Book Club had a program about the use of scrapbooking to tell a story. The book, Scrapbooking is Fun, was the basis of instruction to learn how to construct a book. It became so popular that the director, Edna McNeill has formed a group to meet monthly in order to make more books. Visit our website to donate today! "It Matters To Me!" is the theme for this year's observance of Developmental Disabilities Awareness Month. Please check with our office for ideas of how you can make our community more aware of the people we serve and how they can help us! 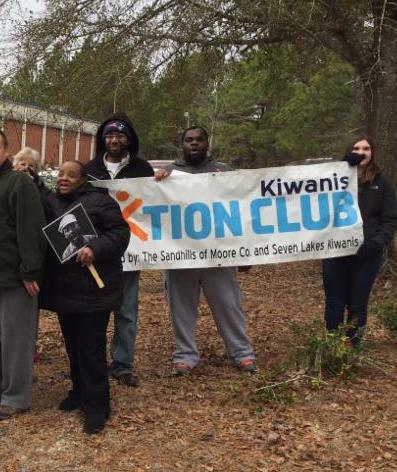 The Aktion Club of Moore County took part in the Martin Luther King Jr. march in Southern Pines on January 16, along with other community members in order to honor the memory of Dr. King's work toward equality among all people. The next Aktion Club meeting will be Feb. 21 at 4 p.m. at Monarch Creative Arts Center. Joyful Noise Performance April 19th! Joyful Noise will be performing for the public on Wednesday, April 19. 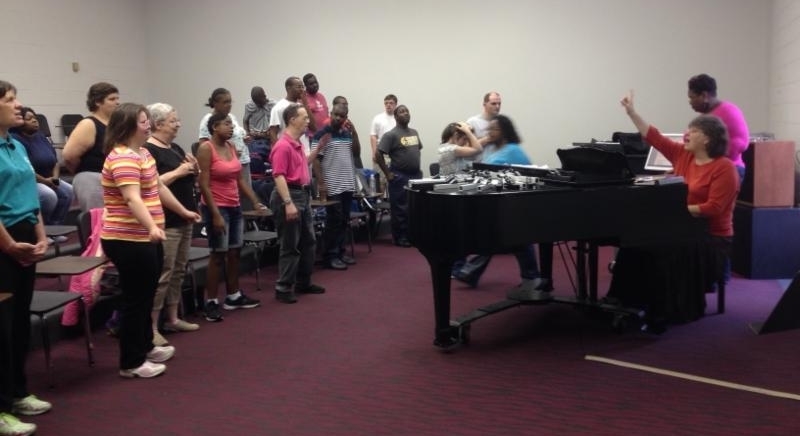 The concert will take place in Owens Auditorium at Sandhills Community College. Please pass the word and bring a friend to come and see this wonderful group! We have had some temporary changes within our staff at The Arc of Moore County. Beverly Davis is on a leave of absence from her duties at First In Families of the Sandhills. Susan Holmes will be handling all FIF applications and requests during this time. Also, Wendy Carter would like to extend a thank you to everyone that sent cards and condolences to her during her father's illness and recent passing. 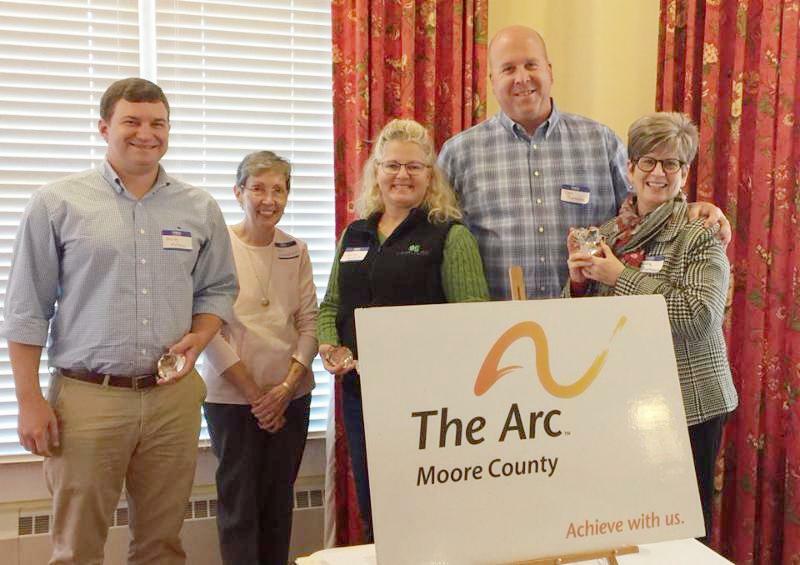 We are thankful to have such caring members and friends of The Arc of Moore County!